Make brownie batter as directed on box; fold in chopped shortbread. Spread in pie plate. Bake about 50 to 60 minutes or until brownie is just set in center; top should be firm with a little give beneath the surface. Cool 15 minutes before topping. Meanwhile, in microwavable bowl, microwave caramel and whipping cream in 30-second intervals, stirring between each, until caramel is smooth and spreadable. Spread over brownie; sprinkle with coconut. 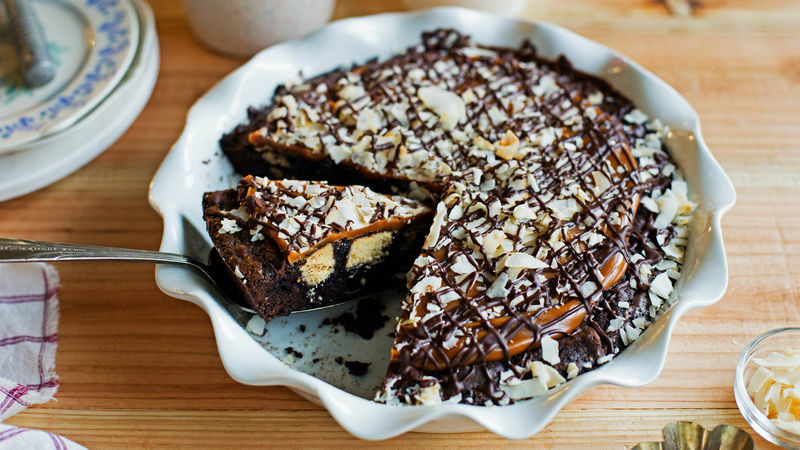 Drizzle melted dark chocolate over top. Serve with ice cream. To take the chill off the eggs, set them in a bowl and cover them with HOT tap water. Let them sit for 5 minutes, and they will be ready to use. Serve this pie in wedges, or family style with a handful of spoons! Either way, make sure there’s ice cream! For a nutty twist, add 1 handful of toasted, sliced almonds or chopped pecans on top along with the coconut.